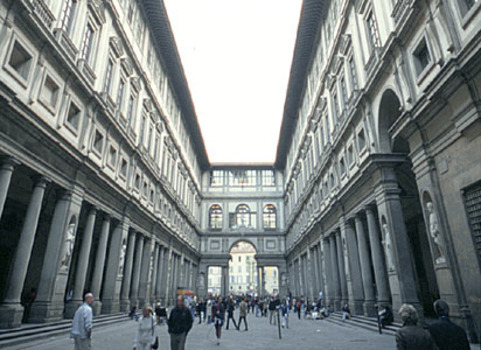 The Uffizi gallery was built in 1581, under the request of Granduca Francisco de' Medici, son of Cosimo I. With hunreds of thousands of visitors each year it's the most visited Italia Museum. A wonderful Church in the heart of Florence. 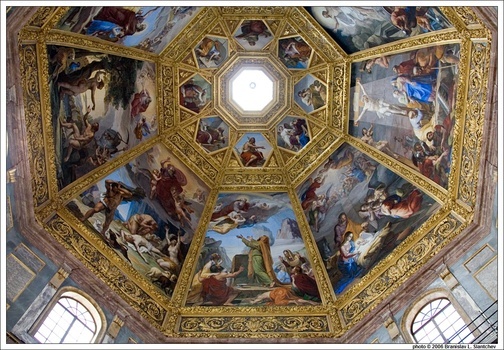 It's beautiful ceilings are nothing short of a masterpiece of Florentine art. A beautiful church only 5 minutes away from our Hotel. In Sata Croce squre you can also admire the statue of the greatest italian poet: Dante Alighieri, author of the Divine Comedy. Located in an ancient building constructed around the mid 1200, the Museum contains a wonderful collection of sculptures and other works of "minor arts". Since 1865 the museum acquired several masterpieces from the renaissance, like works of Donatello, Michelangelo, Verrocchio, Luca della Robbia and Cellini. Piazza della Signoria is the central square of Florence , home of the civil power in the Palazzo Vecchio and the heart of the social life of the city. L-shaped , is located in the central part of medieval Florence, south of the cathedral and a few dozen meters from the Ponte Vecchio and the River Arno . In the past he had various names, such as square or piazza of the Priors of the Grand Duke . The town hall of Florence. The baptistery dedicated to Saint John the Baptist , the patron saint of the city of Florence , located in front of the cathedral of Santa Maria del Fiore, in Piazza San Giovanni . Initially it was located outside the city walls , but it was included , along with the cathedral , the walls built by Matilda of Canossa ( "fourth circle "). It was originally surrounded by other buildings , such as the Archbishop's Palace which came much closer , which were cut down to create the actual square. 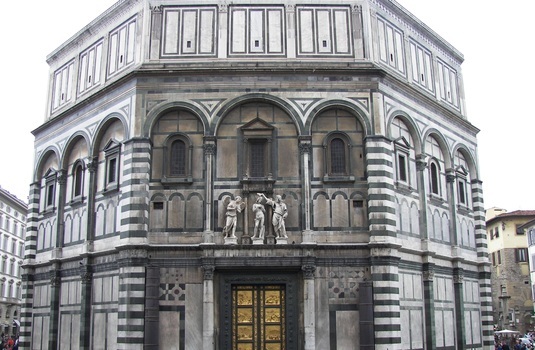 The baptistery is located between Piazza del Duomo and the Piazza San Giovanni , between the cathedral and the archbishop , the religious center of the city. The main facade of the building is octagonal facing the cathedral , while the apse is located to the west. The figure of Neptune , made of white Carrara marble , which incorporates the features of Cosimo I de ' Medici, was an allusion to the maritime dominion of Florence ; it stands on a pedestal decorated with statues of Scylla and Charybdis in the center of the octagonal pool . Although the statue was not particularly popular ( it tells how the Florentines realized at the opening night of the statue to find more work would notice the whiteness of the statue that her beauty , hence the name " Biancone "), work continued over the next decade , with the help of the best sculptors of the city to the edge of the tub . At the foot of Neptune are three newts intent to play tibias gushing water. The tank is octagonal and has four horses of the chariot of Neptune (two in white marble and two variegated pink ) , whose wheels are wheels with heavenly signs of the zodiac , symbolizing the passage of time . At the corners of the tank there are groups of sea gods ( Tethys, Doris , Ocean and Nereo ) , each of which has at the foot of a parade of nymphs , satyrs and fauns in bronze made ​​by Giambologna masterpieces of sophisticated processing of Florentine Mannerism . One of the statues at the corner of the building , one facing towards the wall , was rebuilt in 1831 in Milan by Francesco Pozzi, after the sensational theft of the carnival the previous year. Piazzale Michelangelo in Florence is the most popular point of view of the cityscape , reproduced on countless postcards and a must see for anyone visiting the city. It was built in 1869 designed by the architect Giuseppe Poggi on a hill just south of the city center, on completion of refurbishment works on the left bank of the Arno. Since that year, Florence was capital of Italy and the whole city was involved in an urban renewal , the so-called cleansing or rebirth of bourgeois town: the riversides were created ; on the right bank , instead of the fourteenth century walls were open the avenues in the way of the boulevards ; on the left bank was traced , winding up the hill of San Miniato, the Viale dei Colli , a panoramic road lined 8 kilometers long , was built at the peak of the square , which privileged panoramic terrace over the city. The chronicle of the rapid construction of the latter firm there has been described in detail by the Italian journalist Yorick (known under the name of Yorick ) that does not fail to report as part of the Florentine sorry " for the excessive cost " of the building . Between 1890 and 1935 the area was home to the rails of the tramway of Chianti, that linked Florence to San Casciano Val di Pesa and Greve in Chianti. 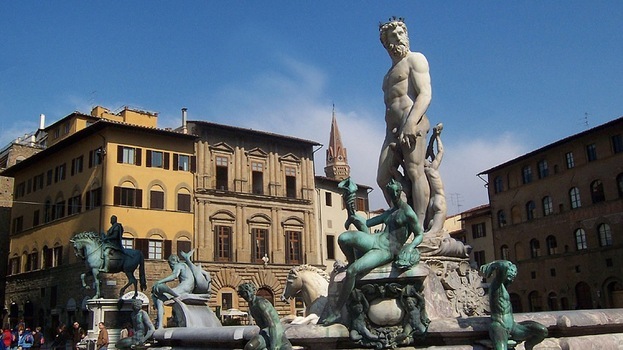 The square, dedicated to the great Renaissance artist Michelangelo , has copies of some of his famous works held in Florence: David and the four allegories of the Medici Chapel of San Lorenzo. These copies are made of bronze , while the originals are all in white marble. The monument was brought on by nine pairs of oxen June 25, 1873 . Poggi also designed the loggia in the neoclassical style that dominates the whole terrace and now houses a rooftop restaurant. 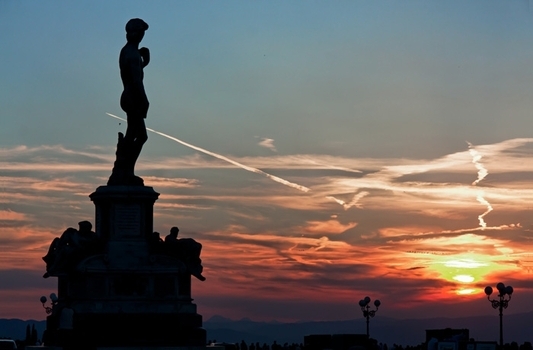 Originally it was supposed to host a museum of works by Michelangelo, ever. In the wall of the balcony, located below the lodge , there is an inscription in large letters reminiscent of his work : Florentine architect Giuseppe Poggi turn towards around here is his monument MCMXI . The view embraces the heart of Florence from Forte Belvedere to Santa Croce through the Arno river and the bridges of Florence in sequence , especially the Old Bridge ; stand the Duomo , Palazzo Vecchio , the Bargello and the octagonal bell tower of the Badia Fiorentina , without forgetting opposed to the hills north of the city center with the Fiesole and Settignano. On the Square can be accessed by car along the tree-lined Viale Michelangelo , built in the same years , climbing the stairs or walking ramps such monumental Piazza Poggi Poggi in the district of San Niccolò. 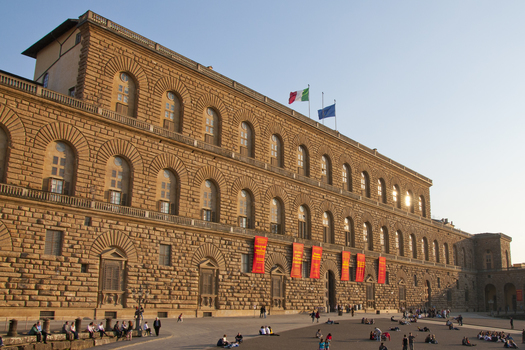 Pitti Palace was the main residence of the Grand Duchy of Tuscany was inhabited by the Medici , from Lorraine and Savoy. It is located in Piazza Pitti at number 1 in the Oltrarno . 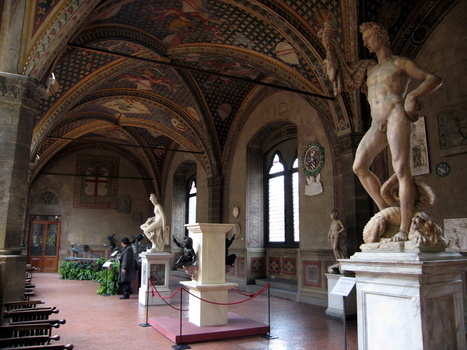 It is situated to the south side of nature : an art gallery ( the Palatine Gallery , with works by Raphael , Titian, etc . ) Arranged in accordance with their eighteenth-century paintings , the monumental apartments , the Winter Quarter and the neighborhood of the Prince of Naples ( ordinarily not open to tourists ) , the Gallery of modern Art ( with the works of the Macchiaioli ) and other specialized museums : the Museo degli Argenti , dedicated to applied art , the Costume Gallery , the largest museum dedicated to Italian fashion , the porcelain Museum and the Carriage Museum . 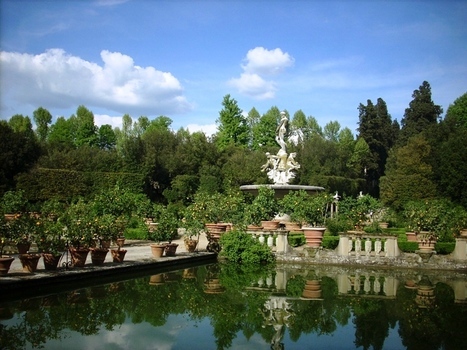 The monumental Boboli Gardens are one of the best examples in the world of Italian gardens . 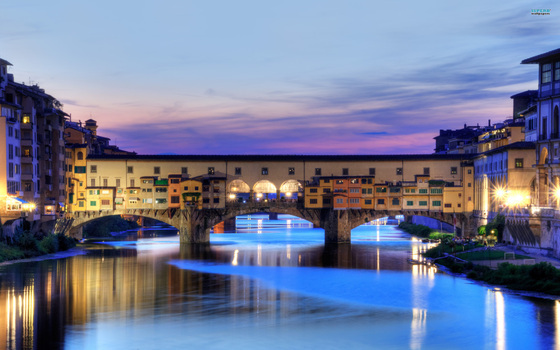 The Ponte Vecchio (the Old Bridge) is one of the symbols of the city of Florence and one of the most famous bridges in the world. Cross the river Arno at its narrowest , where in ancient times there was a ford. The Metropolitan Cathedral of Santa Maria del Fiore is the cathedral of Florence overlooking the square , a symbol of the city and one of the symbols of Italy. It is the fourth largest church in Christendom , after St. Peter's Basilica , the Cathedral of St. Paul in London and the Duomo di Milano [1 ] . It is 160 meters long , 90 meters wide and 43 meters transect of the cruise the aisles , while the base of the dome is 92 Florentine arms wide , equal to 54.8 meters. The inner surface of 8,300 m² , excluding the crypt of Santa Reparata and the other buildings of the complex ( Bell Tower and Baptistery) . It has a peculiar plant , composed as it is of a basilica with three naves body welded to a huge round triconica that support the immense Brunelleschi's Dome , the largest masonry dome ever built , the weight of which is estimated at around 25,000 tonnes. Inside you can see the largest area ever decorated with frescoes : 3600 m², carried out between 1572 to 1579 by Giorgio Vasari and Federico Zuccari . At the base of the lantern marble , there is a rooftop terrace overlooking the city , located 91 meters above the ground , reached by climbing 463 steps . Construction began on the ancient foundations of the church of Santa Reparata in 1296 by Arnolfo di Cambio, was continued by Giotto from 1334 until his death in 1337. Francesco Talenti and Giovanni di Lapo Ghini continued in 1357. In 1412 the new Cathedral was dedicated to Santa Maria del Fiore, and consecrated on 25 March 1436 at the end of the work of Brunelleschi's Dome by Pope Eugene IV . 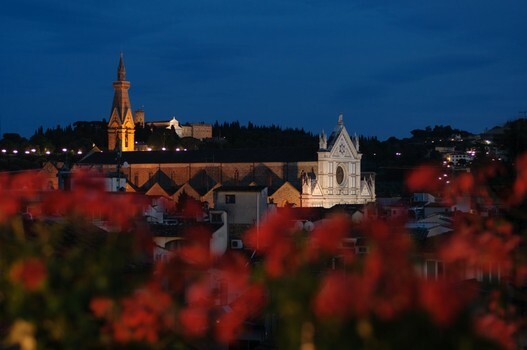 It is the cathedral of the Archdiocese of Florence and can hold up to thirty thousand people. 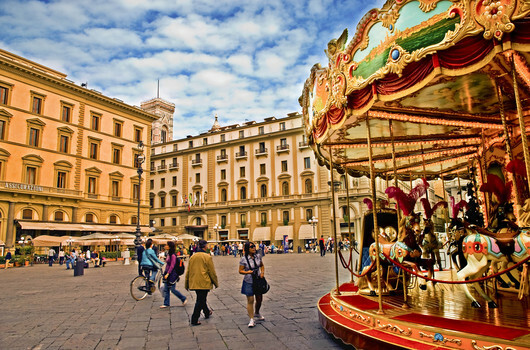 Let us take you on a journey that exposes Florence’s infamous boutiques along with your very own personal shopper. Personal shoppers are perfect for giving fashion tips and most importantly, advise on how you will look in your new trends. Choose from a range of big brands or small Artisans. Then it’s on to catch the bus that will voyage you directly to the legendary Outlet Mall with convenient opening hours. For those less adventurous we have the trusty bicycle. These are very fashionable in Florence and a great way to get about. Florence has invested money into providing cyclists with well-designed roads, making it the ideal way to uncover some of Florence’s historical features. Reaching the beautiful Piazzale Michelangelo will be no trouble by bike and you will be rewarded with a breathtaking view of Florence. There are no limitations to where you can go on a bike, even the Cascine, with its beautiful park on the Arno! Two wheels is the only way to discover Florence and Tuscany. First up, the ‘Vespa’. The perfect way to take in the beauty and easily get from one corner of each city to the next. What better way to experience the splendour of the Tuscan sun and landscape as the warm air caresses your face. Stop and enjoy a tasty lunch, before its back on the open road taking the scenic country roads as you return to the hotel to experience a spectacular sunset on the terrace with champagne. You will begin your adventure at dawn after breakfast and it won’t take long before you are spellbound by the coloured tones of the sky as you watch nature wake up! An image that will be forever etched in your memory. In Sword street, near the city's most elegant streets , Via Tornabuoni, Via della Vigna Nuova and Via Strozzi , you can taste the typical dishes of Tuscan and Florentine cuisine in an ambiance of old tavern . It is not uncommon to find yourself next to the Florentine entertainment and sports, which, like all customers, enjoy good food combined with the simplicity and cheerfulness . The restaurant is on two levels ; the lower level is a characteristic room with vaulted ceiling and tiled floor, perfect place to dine and celebrate in the company of good friends. 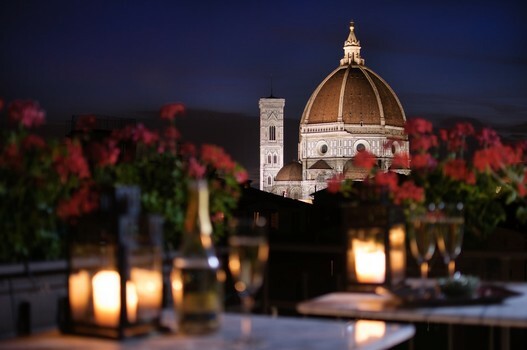 Twenty years ago, the Hapsburg Lorena princes decided to open a restaurant in Florence: La Giostra. The new of a noble family managing with dishes and napkins made headlines, but it was not a surprise to everyone. The friends who were accustomed to gathering around the table of the prince at the castle of Barberino Val d'Elsa, in Chianti, had often suggested him to do that. The restaurants that were supplied with olive oil, wine and other products of the family estate had always been feared of the idea ,as many of their best recipes they had drawn from the Prince own mouth. The son Soldano personally supervises the cellar, and he knew that passion would eventually infect and involve it in a full time job. The passion started in Vienna, when the grandmother used to takie the nephew in the kitchens of the castle -and the servants away-, showing him a "big magic": the sourdough of kraphens.. A fantastic spell that charmed the young prince, destined for a life to browse old manuscripts of recipes, anecdotes, and suggestions to prepare the traditional dishes of the Hapsburg Lorraine's.. "The sciences are not as Minerva came all armed from the brain of Jupiter, are the daughters of time", here is the secret of La Giostra. We expect a typical kitchen and you will taste new flavors, ancient hundreds of years. The flavors of a Tuscany Lost, when still the place ,where the restaurant is now located, covered by arches sixteenth century in red brick hosted the tournament in Piazza Salvemini, that is the reason of the name . Where shiny horses rested, today there are just sixteen tables, at which sit couples in love, beautiful women, celebrity guests, sometimes entire theater companies ... All united by the love for good food and the pleasure of a refined hospitality: in a "homley", home, warm and informal.. Merit of the prince's son, first of all. Merit of flattering reviews from the specialized press. Merit of the historic chef Ubaldo Tonarelli, Florentine doc who is now joined by a number of new talents. Merit of Liliana, who every morning kneads pappardelle noodles and ravioli, bolognese style, with all the freshness of the ingredients freshly picked. A 'merry band of dispensers of joy ... "Because food is necessary and choosing is a privilege, but cooking is art". With deep love for Italy and its culinary richness , Peter Brunel offers a modern interpretation of Italian regional cuisine , with a "sentimental" to the choice of raw materials and a constructive openness to different cuisines . The meeting comes a menu " handmade ", full of surprises and old certainties .